President Donald Trump was the center of attention at the Women’s U.S. Open in New Jersey this weekend, with a crowd of fans waving and cheering as he watched the competition. Fans were heard yelling “I love you” and “I voted for you,” according to a pool report by Politico. One woman became emotional and wiped away tears upon seeing the president. Trump, his son, Eric Trump, and several aides watched the action from inside a glass viewing platform along the 15th hole at the Trump National Golf Club. The president’s appearance drew so much attention that organizers had to remind spectators to keep the noise down. Players at the 15th hole ended up seeing spectator’s backs as the crowd opted for the rare opportunity to see a sitting U.S. president up close. Trump sent several tweets about the U.S. Women’s Open on his way from Bastille Day celebrations in France. “Just got to the #USWomensOpen in Bedminster, New Jersey. People are really happy with record high stock market – up over 17% since election!” he wrote on Twitter on Saturday afternoon, July 15. 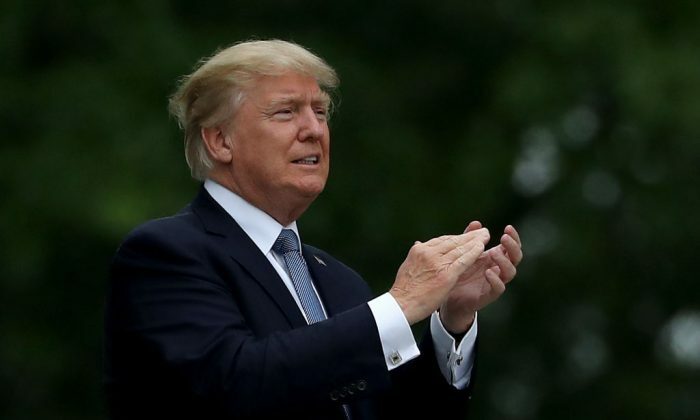 Trump’s warm reception in New Jersey contradicted a recent poll by the liberal anti-Trump Washington Post and ABC News, which showed his approval rating at a six-month low. Several commentators, including Daily Wire’s Ben Shapiro, questioned the poll’s legitimacy, since Republican voters made up only 26 percent of the respondents. The scene on Saturday was even more boisterous. As the crowd swelled to see the president, organizers placed a five-minute limit for people standing at the rope line. Part of the course came to a standstill as spectators, astonished at a chance to see Trump, flocked to get a glimpse of the president. Trump briefly met with Norwegian golfer Suzann Pettersen and gave her a blue “Make America Great Again” hat. The U.S. Golf Association praised Trump’s appearance in a statement issued on Friday. “It is the first time a sitting president has attended the U.S. Women’s Open and is only the third occurrence in our entire championship history,” the statement read. The golfers were happy to have the president at the event as well. South Korean Sung Hyun Park won the tournament on Sunday. Trump and his daughter, Ivanka Trump, both sent Twitter messages congratulating Park. 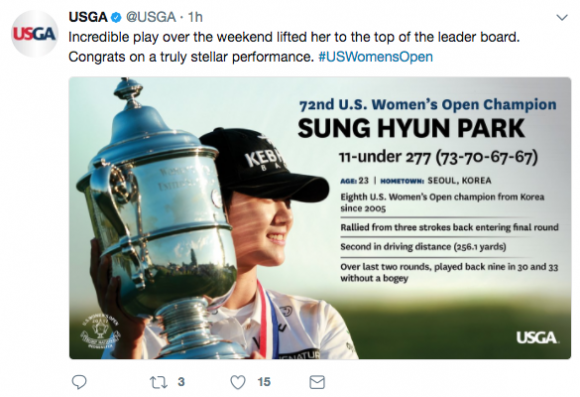 “Congratulations to Sung Hyun Park on winning the 2017 @USGA #USWomensOpen,” the president wrote. 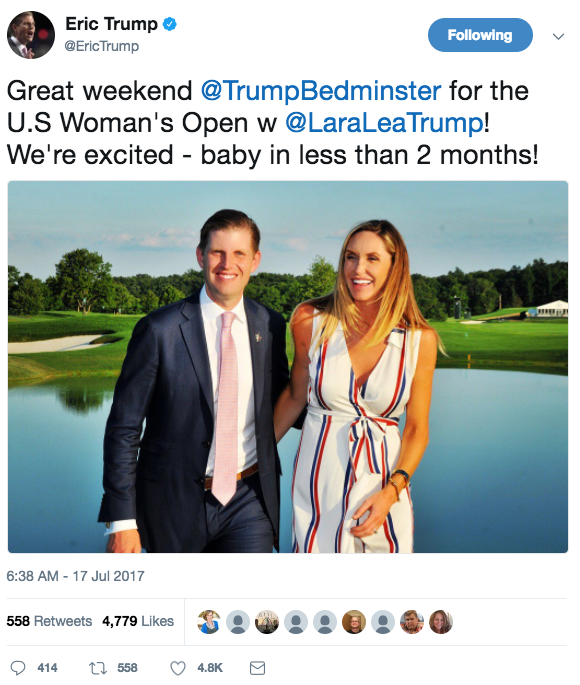 The president’s son, Eric Trump, tweeted a photo from the tournament with his wife Lara Trump, who is due to give birth in two months.